Basically they gave Cory and I free passes to come and play. Even without the free, if I had known about this place I totally would have gone! It's beyond awesome! We spent about 3 hours there and could have easily doubled our time. As it was we missed one entire section and I was kind of pushing Cory a bit so we could see as much as possible! 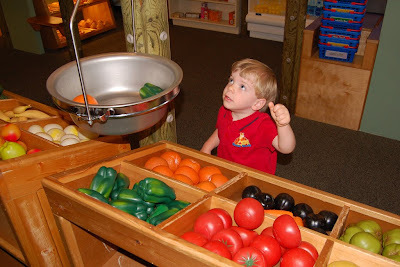 We started in the market section where they had a garden with veggies you could pick. Then there was a produce delivery truck. Finally the actual market where you could pick your food and buy it at the cash register. There was a dairy case, a seafood case, and a bakery section, all just like in a regular store. 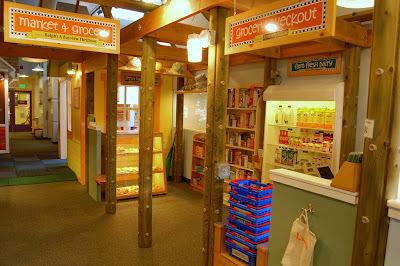 Groups of children could easily pretend to be various employees here. 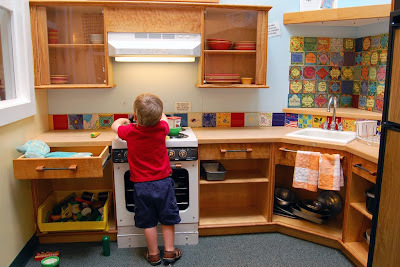 Just beyond that was a child sized kitchen complete with all the pots, pans, utensils, and play food you could want. I'm sitting at the small table where the cooked food could then be served. Next up, ambulance with doctor's office in the background. 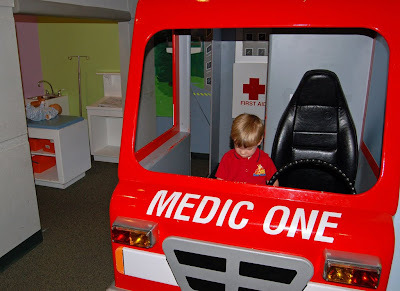 We didn't spend any time in the doctor's office, but all the kids size cars throughout the museum were a hit with my son! On to the other side of the museum where they had some truly unique exhibits. A section with "moon sand" to play in was super fun! There was also a vacuum tube wall that you could arrange sections of pipe, put plastic balls in and then push the button to watch them be pushed along with air. The water table was by far the biggest attraction! It's such a cool thing I could have played with it for quite awhile! 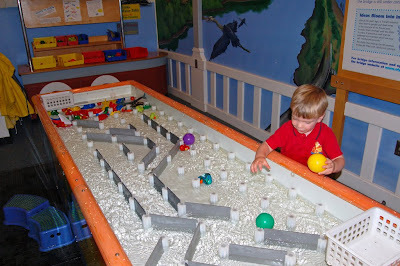 The water starts at one end and then you direct it however you want with little plastic dams. Then there are all kinds of things you can put in the stream and watch them float down. Another room had a giant size pin wall. You know those little 5 x 7 size boxes with hundreds of metal pins in them that you can push objects into to get their silhouette? Well, this one was big enough to push your entire body against. Way cool! 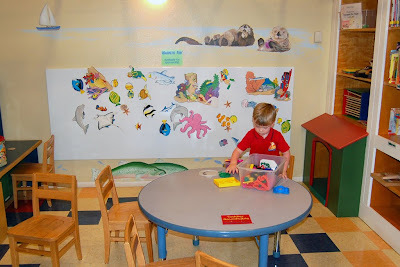 Finally we visited the toddler room which was nicely padded and had some fun stuff. Of course trains were the first thing Cory saw! There was also a bucket of play-dough and some cookie cutter things. This was a hit since we don't have any at home. Unfortunately by then it was nap time and we had to go for lunch, but we could have easily stayed much longer! And no, I haven't mentioned even half the exhibits they actually had there. If we had reason to visit Olympia more than once a year I would definitely be buying an annual pass. For the cost of 4 or 5 visits (parent and one child) you can buy an annual pass and go as often as you like. They also have options for grandparents and other combinations of people. If you're only going to be in Olympia for a visit check out their discount page and see if you can get a cheaper price (they have discounts for homeschoolers and military families too!) We totally could have used the out of town coupon! And to top it all off they are in the process of building a new museum right on the waterfront that will be bigger and better! It will open in the fall of 2011. 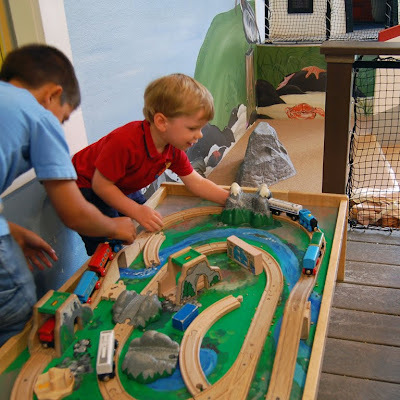 The Hand's On Children's Museum gets a big thumbs up from our house! We'll have to try that one sometime. 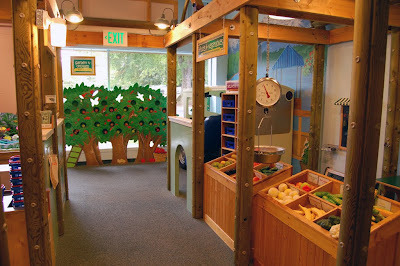 We love the Children's Museum in Seattle, but it's always fun visiting different ones. What! 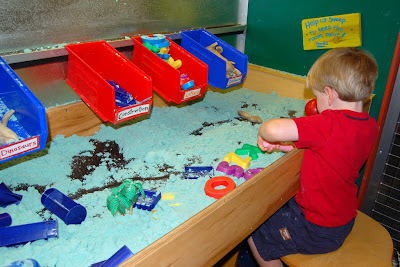 No playdough?! I know what we're getting Cory for Christmas! :) That is a really neat museum. We will definitely have to go there if we head over to that side!